Are you Team Peeta or Team Gale? Relive the action, the suspense, the love story ... fall in-love all over again with our heroine, Katniss Everdeen. What's your favorite scene in Catching Fire? Mine would be the scene where Katniss witnessed Cinna being attacked by the Panem soldiers. Had I been in Katniss' shoes, I would have collapsed on spot and the story will end right there and then. But she didn't allow herself to be affected by seeing Cinna get hurt but it toughen her out more and focus on winning the game to save Peeta. This is one of the special posters included when you pre-order your copy. Now you can watch your favorite movie at home as The Hunger Games: Catching Fire debuts on Blu-ray, Limited Edition 2 discs dvd, and a 2-movie Set DVD on March 15, Saturday. This is exclusively distributed by C-interactive Digital Entertainment. Included in the second installment is a behind-the-scenes look during the filming, deleted scenes that is not in the movie and an audio commentary of director Francis Lawrence and producer Nina Jacobson. Blu-ray copy retails for only P1,395 while the Limited Edition 2 disc DVD is at P795. 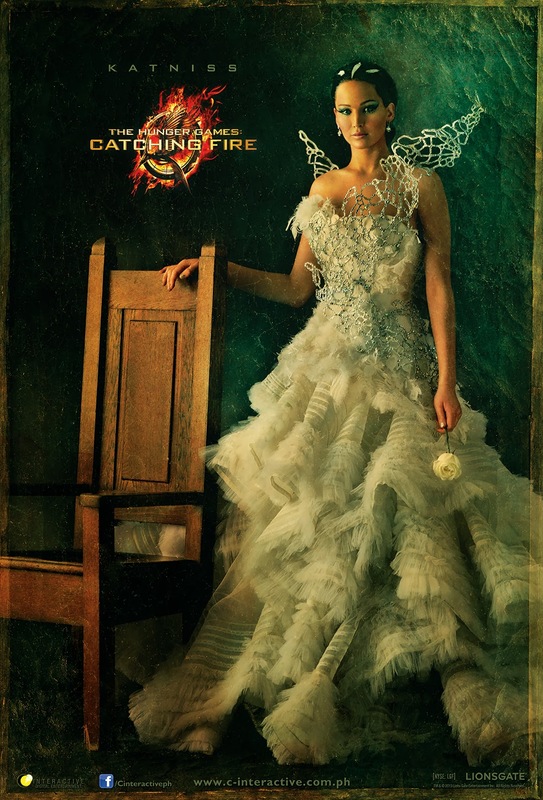 The Hunger Games: Catching Fire and The Hunger Games 2-Movie Set DVD will retail for P995. By pre-ordering any version of the home video of Hunger Games Catching Fire, customers will INSTANTLY receive not one but THREE limited edition 16” x 24” posters of Katniss, Peeta and Finnick and a Catching Fire Bag Tag when you pre-order the Limited Edition 2 Disc DVD or the Blu-ray version! 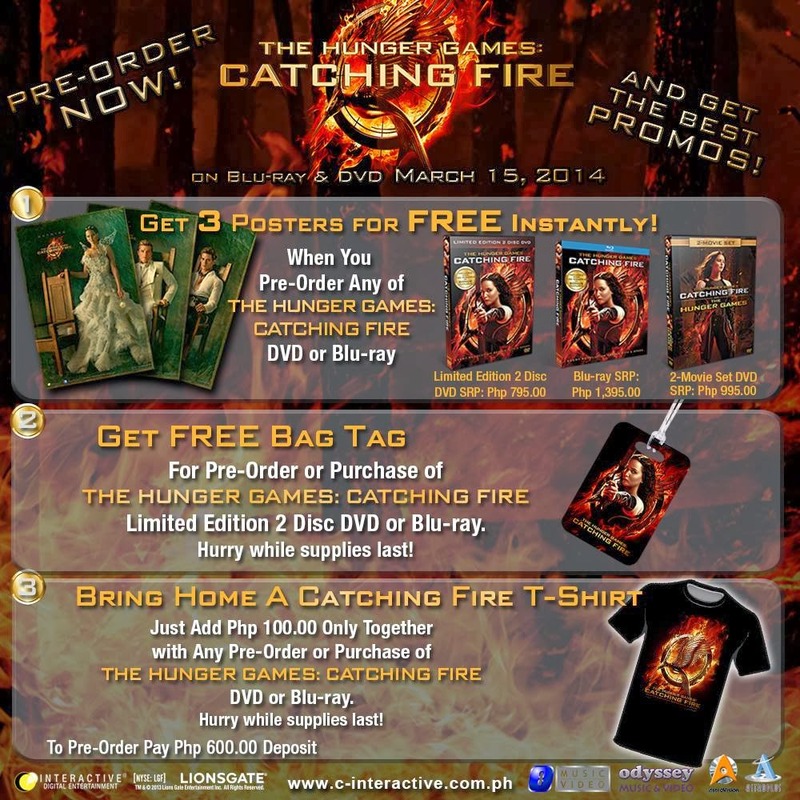 In addition, for just an extra Php100.00, will also get an exclusive Catching Fire T-Shirt only available through this offer. Pre-order The Hunger Games: Catching Fire now at all branches of Astroplus and Astrovision Nationwide and select Odyssey and O’Music & Video outlets.